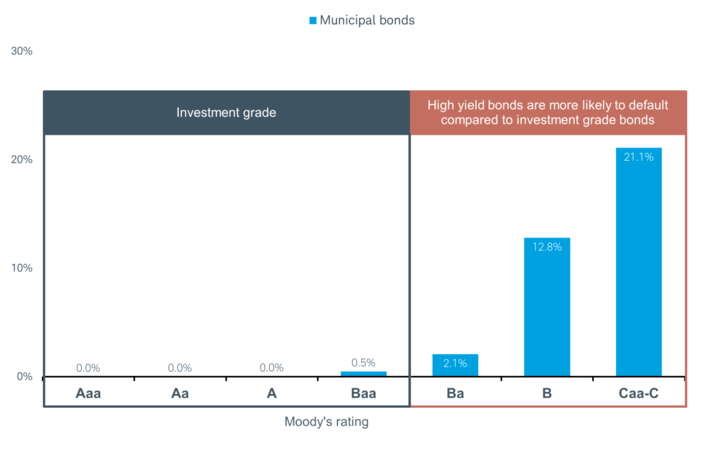 High-yield municipal bonds typically offer higher yields than investment-grade munis, but carry additional risk. A small allocation to high-yield munis can make sense for more aggressive muni investors - but today’s yields are low relative to alternatives. If you choose to venture into this part of the market, we suggest you do so via an exchange-traded fund (ETF), mutual fund, or separately managed account, to help with diversification and ongoing credit monitoring. There's an old joke in the bond market: "What's the difference between a high-yield bond and a junk bond?" "It's high yield when you buy it, but junk when you sell it!" Since high-yield munis - those that are rated below Baa3/BBB-, or not rated at all - were one of the best-performing bond sectors in 2018, should investors consider them more "junk" or more "high yield" today? Source: Bloomberg, total returns from 12/29/2017 to 12/31/2018. See disclosures for a list of indexes used. Past performance is no guarantee of future results. We think the answer falls somewhere in the middle, but we are more cautious on high-yield munis today than we have been in the past. A small allocation to high-yield munis can make sense for more aggressive muni investors today, but if you already have a position we would caution against adding to it. While a tax-advantaged yield above 5% may seem attractive, we don't think it is relative to historical averages. As shown in the chart below, the difference in yields between high-yield and investment-grade munis is well below historical averages. In other words, investors today aren't getting as much compensation for taking on the additional risks that high-yield munis exhibit as they have in the past. Source: Bloomberg Barclays Indexes, as of 1/10/2019. See disclosures for a list of indexes used. Past performance is no guarantee of future results. 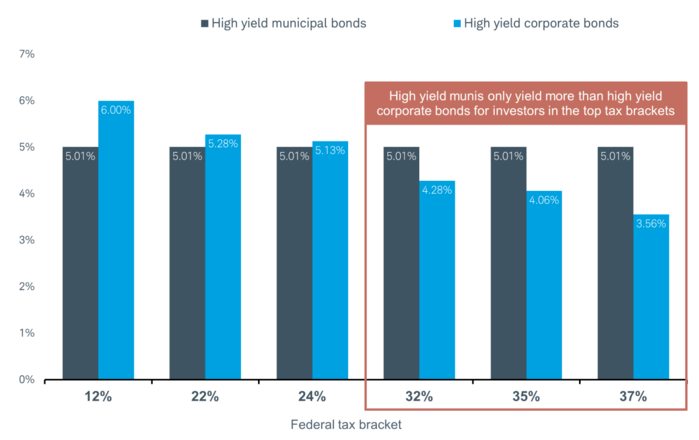 Comparing high-yield munis to high-yield corporate bonds, the same story holds - investors aren't getting compensated to the same extent as in the past. 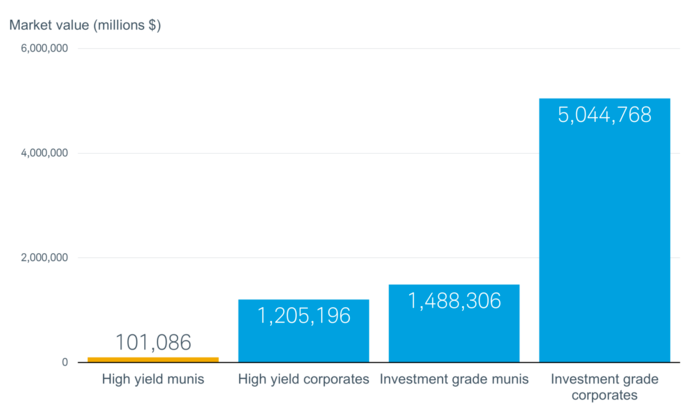 In fact, a muni investor would have to be in one of the top tax brackets to receive a higher after-tax yield on high-yield muni investments compared with high-yield corporate bonds. (Interest payments for municipal bonds, including high-yield munis, are generally exempt from federal income taxes, and may also be exempt from state income taxes if the issuer is domiciled in your home state. Source: Bloomberg, as of 1/10/2019. Note that high-yield corporate bonds assume an additional 5% state income tax and 3.8% tax on net investment income for the 32%-and-above tax brackets. See disclosures for a list of indexes used. It's also important to note that the high-yield muni index has a longer duration - meaning it's more sensitive to changes in interest rates - than the high-yield corporate bond index. 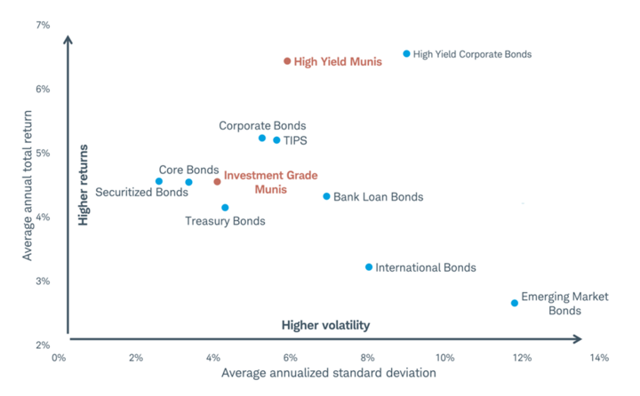 For investments like some ETFs or passively managed mutual funds that simply track the index, high-yield muni investors are taking on greater interest rate risk combined with the other unique risks of high-yield munis, but yields are historically low compared with high-yield corporate bonds. In general, the high-yield muni market is made up of issuers that function with a greater degree of operational risk compared to the investment-grade muni market. For example, over half of the Bloomberg Barclays Municipal High Yield index is made up of bonds backed by payments on tobacco products, real estate development projects, or nursing homes and medical facilities. Although muni defaults historically are rare, when they happen, they've most often been in the high-yield portion of the muni market, partly due to their greater operational risks. 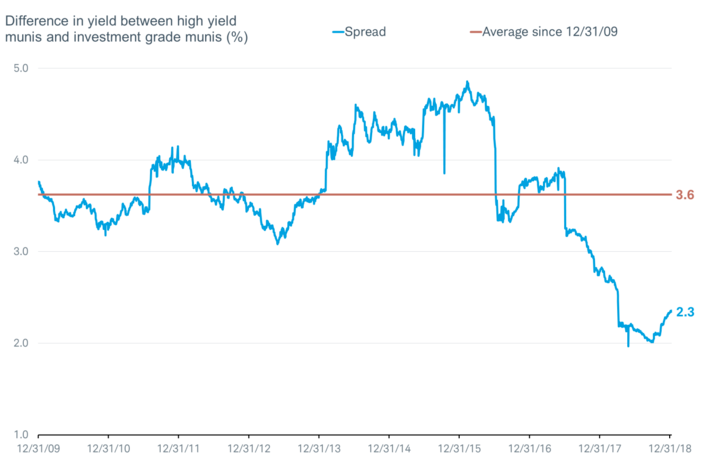 As illustrated in the chart below, over a five-year period, 12.8% of munis rated B by Moody's defaulted. That increased to 21.1% moving into the lower Caa-C rung of the high-yield market. Source: Moody's Investors Services, as of 07/31/2018. Chart shows the five-year cumulative average default rate. Past performance is no guarantee of future results. For the portion of your bond portfolio designed for stability, we don't generally suggest high-yield municipal or corporate bonds. However, for investors with higher risk tolerance and in higher tax brackets, high-yield municipal bonds may make sense for a small portion of your portfolio. But keep in mind that spreads today are historically low, so it's not an opportune time to add to existing positions. 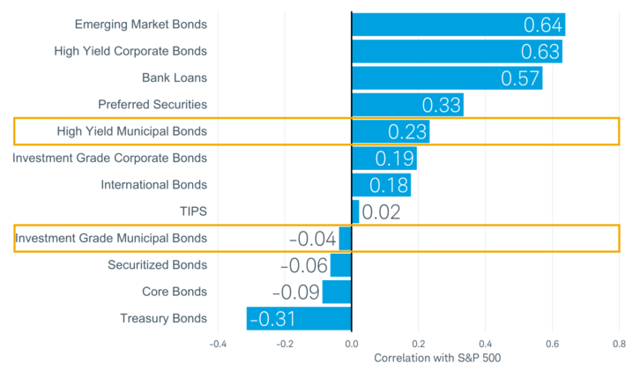 As illustrated in the chart below, historically, returns for high-yield munis have been high relative to other riskier parts of the fixed income markets given their volatility (or standard deviation). Note that future returns for high-yield munis could be lower, due to lower yields today compared with historical averages. Source: Bloomberg, monthly data from 12/31/1998 to 12/31/2018. See disclosures for a list of indexes used. Past performance is no guarantee of future results. Returns for high-yield muni bonds historically have been more correlated with equities than returns for investment-grade munis have been. Correlation is a measure of how closely returns for two investments move together. A correlation closer to 1 means that returns for the two assets move closely together and do not provide greater diversification benefits, whereas the opposite is true for a correlation of negative 1. In other words, investors looking for stability are likely to be disappointed with high-yield munis when riskier investments, like stocks, are falling. For example, during the 2008 credit crisis,4 while the S&P 500® was down 37%, high-yield municipal bonds were down 27% and investment-grade municipal bonds were down just 2.5%. Source: Bloomberg, monthly data from 12/31/1998 to 12/31/2018. See disclosures for a list of indexes used. In the bond market, the size of the market matters. Unlike stocks or ETFs, bonds don't trade on an exchange. This can pose a challenge for investors in parts of the bond market, because nobody is required to execute a trade when you want or at a price you may reasonably expect. Lower liquidity can affect bond funds and ETFs that hold high-yield munis. If it's difficult to trade the underlying investment, the fund may have to revalue the bond at a lower price. As a result, the funds that hold less-liquid bonds could see their net asset value drop more precipitously in a down market. Source: Bloomberg Barclays Indexes, as of 1/10/2019. If you do choose to invest in high-yield munis, keep in mind that yields are historically low relative to other alternatives, and high-yield munis have greater risks relative to investment-grade munis. We also strongly suggest you do so with a professionally managed solution, such as a mutual fund, ETF, or separately managed account. Due to the combination of unique risks that high-yield munis exhibit, a professional manager can help with diversification and ongoing credit monitoring. 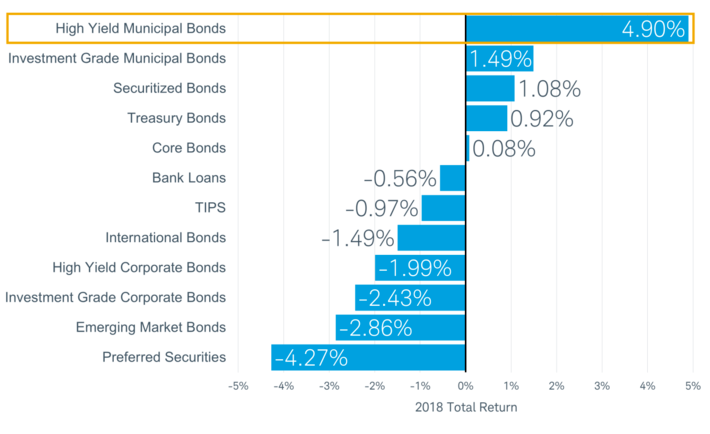 ¹ Source: Bloomberg Barclays Muni High Yield Index and the Bloomberg Barclays Municipal Bond Index, as of 1/9/2019. ² Source: Municipal Market Advisors, as of 12/28/2018. ³ Source: Bloomberg, as represented by the Bloomberg Barclays Municipal High Yield Index, as of 1/10/2019. 4 Source: Bloomberg, total return from 12/31/2007 to 12/31/2008.